This easy black bean dip is another one of my husband’s creations. He is also the mastermind behind the pumpkin enchiladas, guacamole and the easy salsa. He tried making a back bean dip in the past and it was a fail. So when we had some extra dried black beans lying around, he decide to make another attempt at black bean dip. This easy bean dip was a win! I call this recipe easy because it only takes a few minutes to make it. 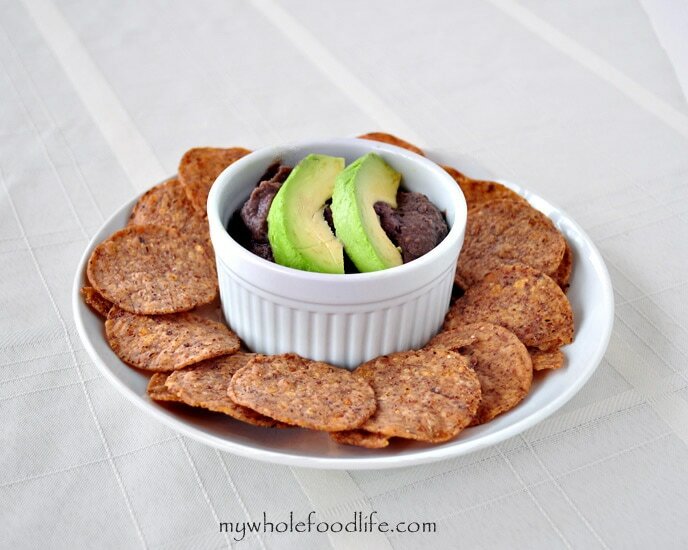 This black bean dip would be a great dairy free appetizer for your parties. A super easy dip great for parties! Put all the ingredients in a blender . This dip should last a couple weeks in the fridge. I think it could also be frozen for longer storage. You can also probably make this in a food processor if you don't have a blender. This looks so good and I am going to be making this for a party this week. What kind of chips are those around the dip? They are what I have been looking for, but don't know what to get when I get to the store. Or, are they from a health food store? I go to one quite a bit. Thank you for your time! This would be the perfect snack to ward off those afternoon munchies. What a great idea to use almond milk! I hope you enjoy it! We love simple recipes here too. I made this last night and used white beans and oat milk, what I had on hand. I layered a tortilla with the dip, then melted cheese and veggies on top of that, it was delicious! Very easy and nice flavor. Not sure what I did wrong. Just tried to make this, it came out very watery, like a thin soup. Thinking about adding another can of beans or heating it up and eating it like a soup. Any ideas what happened? I'm not sure. Ours was quite thick. I'm sorry that happened. :( Yes I think turning it into a soup sounds like a good idea. I would hate to see it go to waste. Were you draining the beans? If using canned, they need to be drained. Mine was very watery as well. If using canned beans do you need to rinse and drain? Thanks! If using canned beans, drain and rinse and then pat dry. Did you use canned beans? Maybe that makes a difference? I haven't tried this recipe with canned beans. Yes, and I didn't drain them. I am sure that is why it was too watery. Thanks for responding. I'm glad you liked it despite it being too watery. Did you use canned beans or dried beans? Maybe that is the difference? I did indeed use canned beans. I guess I need to try the recipe with canned beans. Maybe there is a difference. I used dried beans. Just one note: There's no way this can be safe to eat for two weeks, refrigerated or not. There are no natural preservatives such as lemon or lime juice in it, and even then, bean dips usually don't last for more than five days to a week tops. What about the garlic.? Amazing antimicrobial properties? I made this using 1 15 ounce can of black beans, drained and rinsed, 1/3-1/2 cup of homemade chicken stock (I didn't have any vegetable), 1/2 tsp cumin, 1/2 tsp chili powder and 1 crushed garlic clove. It's delicious! Thanks for sharing the recipe! Next I'm trying the quinoa veggie burgers! I'm so glad I found you blog. Cooked way too many black beans and was looking for a way to use them. This looks perfect. Thanks for the recipe! I made this exactly as said and found it to be too thin to be considered a dip. (That may be my blunder because I wasn't sure if I had to rinse and drain the beans.) HOWEVER, it made a fantastic soup! I heated it up and it was delicious! I cant wait to try this recipe for black beans. I love dips and chips. It sounds delicious.